One of my favourite movies is Pee-Wee's Big Adventure. I've seen it tons of times but never in a theatre on the big screen. It was playing tonight at the Royal Cinema (on College Street and Clinton Street). Gord's not a fan of the movie but knows I like it so offered to go if I wanted to go. I bought the tickets before he could change his mind! DRAG QUEENS. DRINKING GAMES. DRUNK COMMENTARY. Screen Queens is one part Mystery Science Theatre, one part Drunk History, with a dash of Elvira and add lots of booze. Get ready to experience movies like never before. 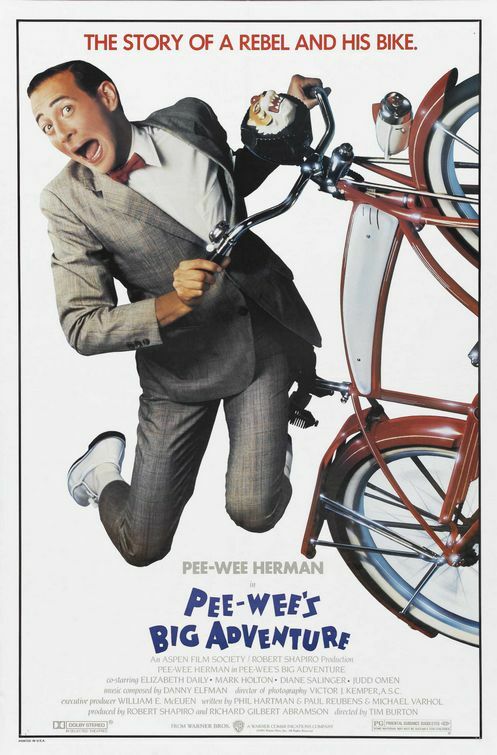 The cartoonish and childish character Pee-Wee Herman goes on a big adventure for the first time ever when his beloved shiny new bicycle is stolen by his nemesis Francis Buxton, a fellow man-child and neighborhood rich "kid." And he sets off on an obsessive cross-country journey, determined to recover it. ABOUT US: Come join the one and only drag queen extraordinaire Allysin Chaynes for a cinematic journey through your favourite cult films. FULL movie, live and potentially very drunk commentary, special guests, performances, drinking games and plenty of surprises. This is a licensed event. It wasn't well organized at all. The doors didn't open until 7:45pm and the movie started at 8:30pm. The line-up at the concession stand was so long they delayed the start of the movie ... had they opened the doors on time, they could have started on time. The hosts were a couple drag queens. I knew ahead of time there were be "commentary" by the hosts. I thought it would be like the Die Hard Quote-Along we've been to the last two years ... the host occasionally jumps in with comments. Not here! Allysin and Fisher babbled non-freakin'-stop the entire time and weren't really funny. They were louder than the movie so it's a good thing the movie was closed-captioned because it was hard to hear what the actors were saying. It was annoying but I was able for the most part to tune them out. Plus I've seen the movie so many times that I could recite a lot of the lines. There was an intermission halfway through the movie. It was obvious Gord wasn't enjoying the movie either so we left.